The sheer joy that comes from a newly recharged set of stationery is criminally underrated as is its potential to be a lovely, thoughtful, useful present, if one can just customise it. Well, you’re in luck! We stumbled upon Nini and Co., a brainchild of Tanvi Agrawal, which customises stationery and lifestyle products for adults and children. Coming at pretty competitive prices, we’re mighty pleased with what they have to offer. Whether you want to customise your notepads or liven up the place with a quirky quote frame or bring home some magic with custom dreamcatchers; they do it all and much more. Some of the more popular stationery items in their range include custom envelopes, stickers, folders, custom notebooks/notepads, clipboards, custom sippers and other kinds of planners. From their lifestyle range, you can get customised stone-printed photo frames, canvas quotes, quirky door hangers, table mats and fairy lights. The personalised frames and stone-printed frames were our favourites and we also loved the quirky 'Do Not Disturb' door signs. Starting at INR 300, prices vary depending on the item and kind of customisation you choose. Whether you want funky colours to liven up your desk, a classy gift for a loved one or a name customisation for your young cousin - there’s quite a variety to choose from. As of now, Agarwal works from home, but you can reach her on her mobile number or on Nini & Co.’s Facebook page. 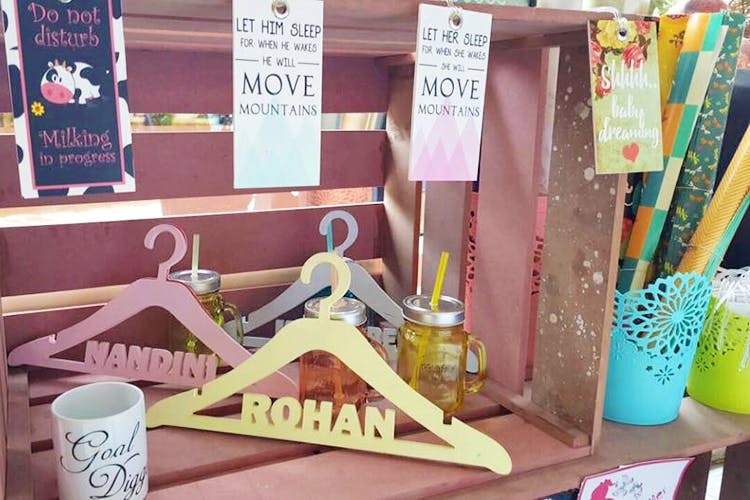 There’s also a good chance you’ll find spot a Nini & Co. pop-up stall at one of the city’s many art and merchandise exhibitions and flea markets. If you are a sucker for all things pretty, this one will definitely be in one of your favourites. A lot of their stuff seems like it's out of Pinterest and who doesn’t love that? So the next time you want to gift a friend something that’s artsy, thoughtful and utilitarian at the same time, you may want to check out Nini & Co.